A couple of days back I had asked my Facebook fans a question about recipe requests, which is if they have any recipe they would like to see here. I got a lot of feedback. Poppyseed cupcakes or muffins, choux pastry, eclairs, yeast breads, pies, cheesecakes were asked the most. I didn’t have time to bake something as elaborate as pies, cheesecakes or choux pastry so decided to go with a rather simple one. 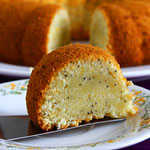 I too have wanted to try baked treats with poppy seeds for a long time now, especially after trying a moist lemon poppy seed bread in my son’s school 2 months back. The Facebook request made me go for it immediately. 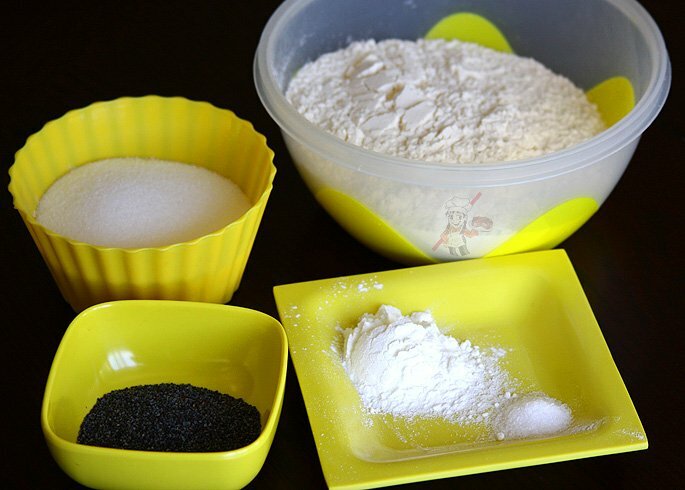 I started browsing for recipes and found that either lemon or orange or a combination of both was used in combination with the poppy seeds, be it muffins, cupcakes or quick breads. I liked the bread which I had in school so wanted to try that flavor combo itself but decided to bake muffins instead. I bookmarked a couple of recipes but ended up tweaking the vegan chocolate chip muffin recipe itself because I loved the taste and texture of it. 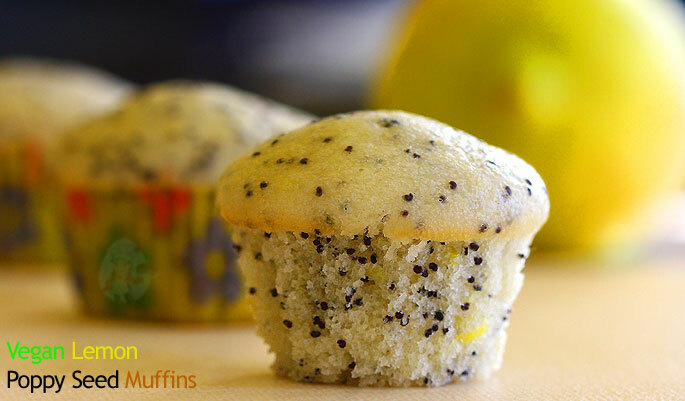 The original recipe is from Vegan Brunch, but I have modified it to bake these moist lemon poppy seed muffins. It can very well be cupcakes too because it had a nice smooth top when it was done baking. 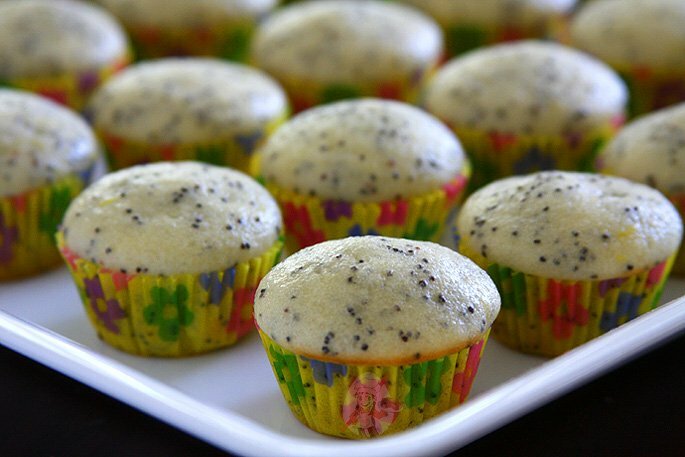 With some lemon-cream cheese frosting, these poppy seed cupcakes would be a cute addition on any breakfast, brunch or party table. Initially, it felt like that it was not sweet enough but ended up being perfect for us. I don’t have enough adjectives to describe these cute, moist and fluffy mini muffins. 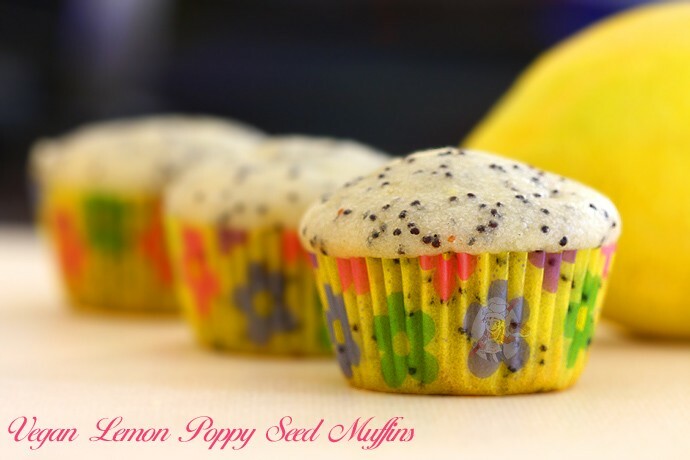 The flavor of fresh lemon juice and zest along with the crunchy poppy seeds will make these bite size muffins a mega hit. Preheat oven to 375F/190C for 15 minutes. Lightly grease a 24 cups mini muffin tin or line it with paper liners. In a medium size bowl mix together the milk and lemon juice; set aside for about 5 minutes (Check My Notes). After that stir in applesauce, oil and lemon zest. 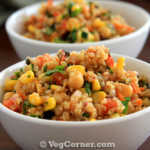 In a large bowl, whisk together the dry ingredients and make a well in the center. Pour the wet ingredients into the flour mix and stir until just combined. Do not over mix. 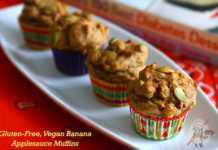 Scoop out about a tablespoon of batter in each muffin cup. Bake for about 10-12 minutes or until a toothpick inserted in the center of a muffin comes out clean. Mine was done in 10 minutes. The milk and lemon juice mixture did not curdle as much as I expected. The milk and vinegar combination curdles very quickly but since I was making lemon poppy seed muffins I decided to use extra lemon juice itself. 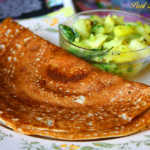 The mixture of non-dairy milk and vinegar/lemon juice is to make a vegan alternative for sour milk or buttermilk. I started off with just 2 tablespoons of lemon juice but after tasting the batter once everything was mixed I felt that it did not have enough “lemony” flavor. So ended up adding another 1.5 tablespoons of the juice, making it 3.5 tablespoons in total which was the entire juice from 1 lemon. I guess the amount of juice you use will actually depend upon how sour the lemon you are using it. Do you think this could be made into a bundt cake? Would there be any changes needed in the ingredients? Thank you so much for your website! My grandson has an egg allergy and your yellow cake is our favorite – – we use it for all parties! You’re very welcome, Denise. It should work. You might have to bake it a bit longer than muffins. I have made these a couple of times now. Sooo good..this is the texture i like in muffins..soft and fluffy. I just put 1/4 lemon juice and added more zest; just because i love lemons and reduce the sugar to 1/3. I also made the carrots muffins. My 2 yrs old daughter just loves them. She s allergic to eggs ,dairy. So your recipes come just perfect for me. Now she wont miss out on cakes..am so happy that she can enjoy cakes too. I can also say now that i have tasted eggless baking i prefer it to eggs. You’re very welcome Maddie. Thank you very much for taking the time to leave your comment. What can I use instead of sugar – stevia perhaps? I’m guessing so. I have not tried it Nina. 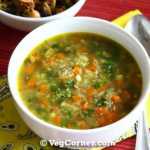 Could you suggest a substitute for applesauce in this recipe? You can try flax egg instead. Can we use ordinary milk? 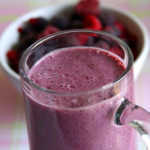 Yogurt or pureed silken tofu can be used instead. Am just about to give these treats a go – can you tell me, when you upped the lemon juice, did you reduce the milk, or are the amounts shown in the correct proportions? The amount shown is the correct proportion Susan. 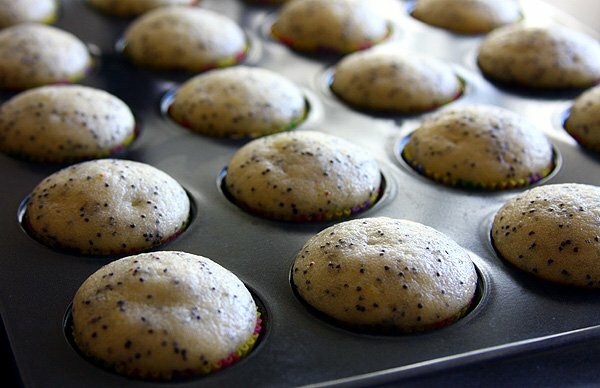 I don’t have mini muffin tins, can I make regular sized muffins with this recipe? Would I need to bake them longer? Yes you can Elise. Fill it 2/3rds full. Bake it longer, maybe around 15-18 minutes. These were so good…tangy and sweet was such a hit combination! I tried it a couple of times and found that my batter was a little dry, somewhat between bread dough and cake batter and I had to add about 1/3 cup of milk extra. Could that be because I made with milk instead of rice milk? I’m guessing you are baking it a bit too long. Thanks for your reply 🙂 I always bake cupcakes and have only just started baking muffins. How much batter needs to be filled into the liners to get that perfect dome on top ? More than three quarter full ? I just did some yesterday and it was obviously not sufficient as i did not achieve that dome. What can I substitute avacado oil with ? Any oil is fine Shaila. I made these with almond flour and used liquid coconut oil and they did not turn out well at all. The center did not cook and the edges burned. The muffins actually shrank in the center instead of rising. Was it the almond flour? Help! Thanks in advance! Yes Vikki. You CANNOT simply substitute gluten-free flours like almond flour measure to measure for all-purpose flour. It doesn’t work like that. Gluten-free baking recipes require quite few changes like using xanathan gum etc. Every time I make these, they turn out gooey. I follow the directions exactly. Any suggestions? I am baking at 7,000 feet elevation. I think high altitude baking needs some alterations in the temperature and time. You should be able to find some information if you Google. Hi! I want to know how much calories is the lemon poppy seed cupcake. Sorry Narayani, I don’t have the info on it. 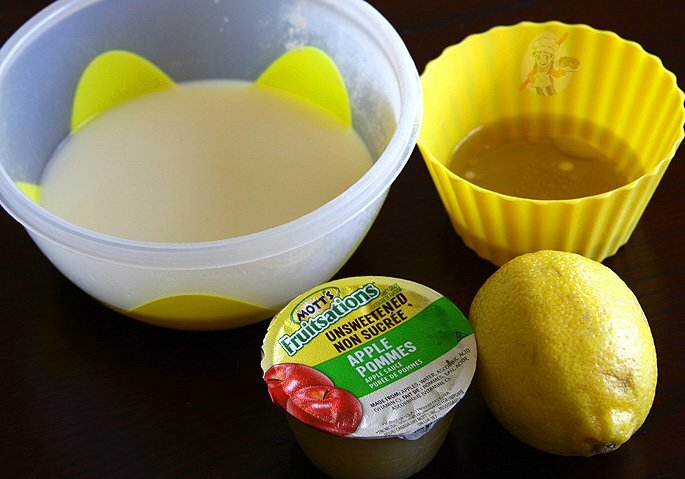 So I tried to make these today with regular milk and it curdled on adding lemon juice. Can I still proceed with it? I made these muffins today and they turned out great! Made some minute changes – whole wheat flour, milk, ACV, canola oil, and made 12 big muffins. Thank you for this wonderful recipe – this one is a keeper. Any specific reason for using avocado oil? Can I use any other oil instead? Personally I’m avoiding other vegetable/seed oils for health reasons. Avocado and coconut oil is the healthiest for cooking and baking, especially when heating at higher temperatures. For non-vegans, can plain milk be substituted instead of rice milk? Yes it can be subsituted. 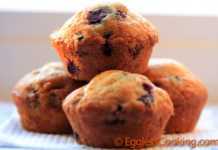 Very gorgeous muffins, this is something extremely irresistible..